Libertyville, IL, March 27, 2019: For nearly two decades, Zengeler Cleaners has hosted a huge collection drive for prom dresses and accessories in support of the Glass Slipper Project. The historic cleaner is excited to announce a new partnership with Mothers Trust Foundation., who will provide a similar service for local high school students: the distribution of lovingly-worn prom dresses and accessories at no cost to students currently enrolled in any Lake County, IL, high school. Mothers Trust Foundation (MTF) is a Lake Forest-based organization that has provided immediate assistance to children throughout Lake County since 1998. "Zengeler Cleaners is extremely pleased to support this new opportunity for local high school students," said Tom Zengeler, President of Zengeler Cleaners. "We've always believed there was a need to offer free prom dresses and accessories for Lake County high schools. Hats off to Mothers Trust Foundation for making this happen!" The two-day, no-cost event hosted by MTF is call a "Pop-Up Prom Shoppe, and is open to any Lake County student with a high school ID. The prom dresses and accessories will be distributed at the College of Lake County's Grayslake Campus from 10:00 am to 4:00 pm on Saturday, April 6, and Sunday, April 7, in the auditorium and conference center located inside Entrance A. The facility includes several rooms that offer private changing accommodations, and volunteers will be on hand to help each student select the perfect dress. "Mothers Trust Foundation is excited to launch our first Pop-Up Prom Shoppe," according to Susan Suhling, Executive Director of MTF. "We've received so much positive support from everyone involved – local schools, our Board of Directors and volunteers – all have worked tirelessly to make this event a huge success. We look forward to working with the students on April 6 and 7." MTF promoted the Pop-Up Prom Shoppe by sending a series of notices to all Lake County High Schools and with a number of postings on Facebook. "Mothers Trust Foundation would like to thank everyone who helped make our Pop-Up Prom Shoppe possible," continued Suhling. "Special thanks to Zengeler Cleaners for collecting thousands of dresses, Home Depot for providing racks to hold the dresses and mirrors so our young 'shoppers' can see how fabulous they'll look wearing their prom dress, The Grand (Appliance) Foundation for providing additional funding support and the College of Lake County for allowing us to use their beautiful Grayslake facility." ost of the dresses collected by Zengeler Cleaners come from high school students in Lake and northern Cook Counties, while others are donated by individuals who often purchase brand new dresses and donate them to the annual collection drive. The result: thousands of students for whom prom was out of reach because of the expense now have an opportunity to enjoy a lifetime of memories. The partnership with College of Lake County added a unique educational dimension to the Pop-Up Prom Shoppe. A continuous-loop video will run in the auditorium throughout the event, providing helpful information about continuing educational opportunities at both CLC and the Technology Campus. CLC staff will be on hand to answer questions about how to apply, financial aid opportunities and the admissions process. There will also be opportunities to learn more about Mothers Trust Foundation. MTF was founded in 1998 by Barbara Monsor following her 18-year career at Youth Guidance in Chicago, where she witnessed firsthand how a seemingly small amount of assistance might change a challenging situation for a child. Her idea: connect people in desperate situations with those who want to provide assistance where it will truly make a difference. Barbara's vision was to focus on the individual child/youth. MTF responds quickly to provide support for specific, short-term needs not funded by other sources, working with over 200 Lake County schools and social service providers who identify the needs and present them to MTF. From its first grant in 1998 through the end of 2018, MTF has assisted nearly 37,000 children and their families with $2.9 million in grants – helping make the impossible possible. 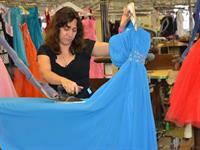 A picture of Gloria Hernandez of Zengeler Cleaners pressing one of the donated dresses is included below. More information about the Mothers Trust Foundation is available at motherstrustfoundation.org. For more information about Zengeler Cleaners, please contact Tom Zengeler at (847) 272-6550, ext. 14, or visit zengelercleaners.com. Zengeler Cleaners' stores are located in Deerfield, Hubbard Woods, Long Grove, Northbrook, Northfield, Winnetka, and two in Libertyville.